Black mushrooms have long been considered hardly probable not the most suitable for pickling mushrooms. They are easy to collect. Dark hats stand out against the bright autumn foliage, and they grow in groups. Saw one fungus, you will certainly find a number of more several. Black mushrooms – robust agaric with dark cap of dense, sometimes reaching 20 cm in diameter. Leg н7его have the same color as the hat. With other mushrooms to mix it up difficult, but still possible. For example, in coniferous forests there are similar mushrooms with fringed edges. Collecting them is not need, they are often inedible. 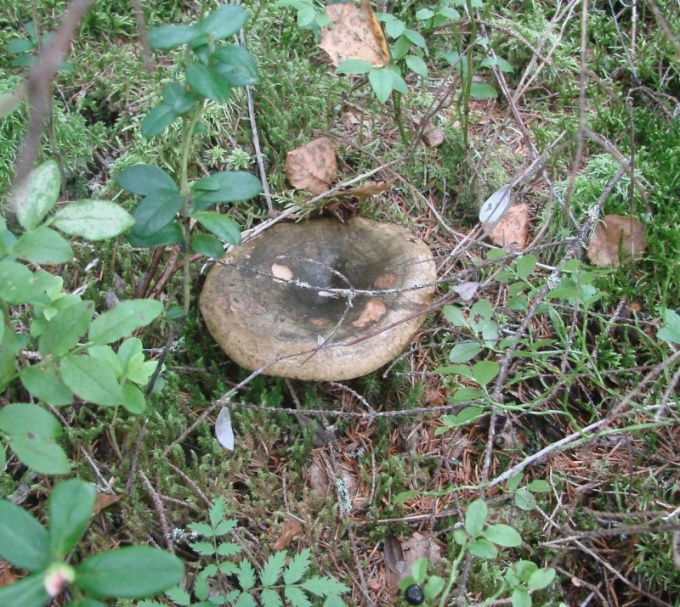 Grow black mushrooms in birch and mixed forests. It is usually harvested in August. Like other mushrooms, black secretes a sticky juice, the smallest droplets of which can be found on the plates. Never collect mushrooms in the forest, you do not know. Some mushrooms, while not poisonous, can be bitter. Like other mushrooms, black you can salt the cold and hot method. Pre-mushrooms need to prepare. Returning to the "quiet hunt" as it should rinse mushrooms, remove the leaves, ground and other dirt. If there are worm-eaten parts must be cut off. The stems from the black mushrooms are edible too, so you don't throw it away. Pour into a large bowl of cold water, and put the mushrooms with their tops down. It is necessary to salt the mushrooms not turned bitter. Steep the mushrooms for a couple of days, not forgetting to change the water. This should be done at least once a day, but twice. Try to collect mushrooms, in which there are no traces of worms. In salted black mushrooms it is important to calculate the amount of salt. If it is too small, the mushrooms will disappear if too many will turn out tasteless. Normal calculation – 4% of the total weight of the soaked mushrooms. The number of mushrooms depends on the choice of dishes. This can be wood (preferably oak) barrel or glass jar. Metal utensils should not be used. The leaves must lie in a single layer. On it lay the mushrooms – as with soaking, hats down. Put a few peas of black pepper and pour all this salt. Then alternate layers of leaves, mushrooms and salt, while the Bank will not be filled, and the top should be a layer of leaves. Put the round cover and it should be free to enter into the jar. On the cover put the stone (which is pre-wash and even boil). As the yoke you can use a jar of water. The entire structure put it in a cool place (for example, on the bottom shelf of fridge) for about a month. Black mushrooms can be salted and hot. As in the previous case, they need to clean and sort out, but a soak is not required. Mushrooms add to the pan, bring to the boil and simmer for 20 minutes. Don't forget to remove the foam. If you cook the mushrooms chunks, water should be changed every time. Mushrooms drain in a colander, rinse with running cold water, then place in a container for pickling, adding together with the salt, dill, onion and garlic. The salt will need a little more than cold salting – 5-6%, and seasonings add to taste.